My absolute favorite thing that has come from this blog is the feedback I get from all of you fabulous ladies out there who tell me you relate to what I share. This brings me to Game Time! You know I love a hashtag game. Here are my “Sometimes…” confessions as of late. Share your “Sometimes…” moments with me and I’ll do a drawing for someone to win a pair of Stella and Dot Studs of your choice! 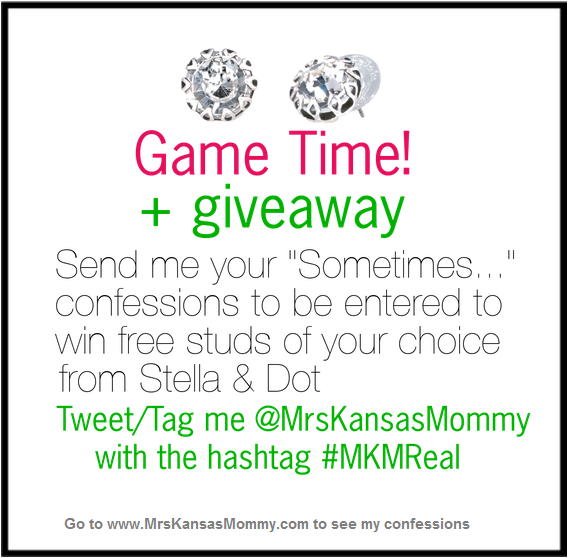 Just don’t forget to use the hashtag #MKMReal and tweet/tag me @MrsKansasMommy on Twitter or Instagram. Sometimes in order to get Avery to be extra sweet and attentive to her little sister I have to concede to pretend Savvy is really our puppy named Golden. At first I felt bad about treating my 1 year old as a dog, but then I saw how much Savvy likes having her sister rub her belly so I just go along with it. Sometimes if I don’t feel like sharing, I tell my kids I put “spicy powder” on whatever it is I’m eating or drinking. Everyone knows spicy powder is invisible. Sometimes I use our dog, Audrey, as a babysitter by giving Avery a bunch of cheerios and telling her she can go in the laundry room and try to train Audrey or dress her up. Audrey is highly annoyed at me when I do this, but at least I get a few minutes of free childcare. Sometimes Savvy is so quiet in her high chair that I will get into doing the dishes or reading an article and be completely surprised when I realize she’s still there like 20 minutes later, just waiting. Sometimes I let my kids eat food that has fallen on the floor. Mine are all mommy-related today but I’d love to hear any that you want to get off your chest. Do share! sometimes I pretend I have to #2 so I can be alone.